In over 30 countries around the world, Tohatsu outboards enjoy a standard of engineering excellence that others respect. Every engine is water tested before leaving the factory and this is backed up by the assurance of a limited warranty which is one of the best in the industry. Link this with an outstanding after sales service and you have one of the best in the world. Tohatsu outboards were not originally designed for the leisure market, but for use in Japanese commercial fishing. This application puts motors to the ultimate test - long hours of running for days on end, often in harsh conditions. Since Tohatsu entered the consumer market over 40 years ago, Tohatsu owners have appreciated the same thing that Japanese fisherman learned: Tohatsu outboards are tough and reliable. Your time on the water should be filled with pleasure. Tohatsu offers the reliability and rugged performance that will give you peace of mind while you are concentrating on what you love, whether it is fishing, boating with your family or relaxing on the water. For many years Tohatsu carbureted 2-stroke outboards have been hailed as the most reliable outboards by experts - from marine editors highly respected for their knowledge of the entire industry to experienced mechanics who work on multiple brands. 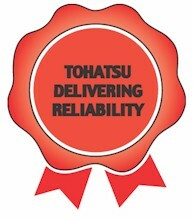 No technology is incorporated and put on the market until we are convinced that it is ready to deliver the same reliability that Tohatsu is famous for. The TLDI® Series are Tohatsu's award winning outboard motors that have an established reputation for being compact in size while demonstrating highly desired features such as low emissions and high fuel economy that are demanded by the new generation of boaters. They are powered by a direct fuel injection system and a 32-bit ECU (Engine Control Unit). The ECU gives precise fuel injection instructions in accordance to the operating conditions detected by the multiple sensors located on the motor. 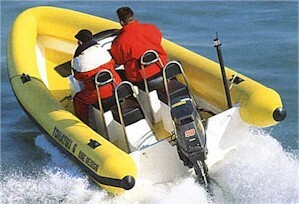 Tohatsu's dinghy range consist of a slatted, air mat and plywood floor series as well as a sport boats and small rigid inflatable boat series. 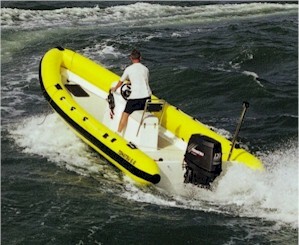 Tohatsu marine has now joined forces with a premier inflatable manufacturer, to offer a comprehensive range of boat and engine packages at highly competitive prices. The versatile and rugged range of inflatable is ideally suited to Tohatsu's lightweight and durable outboards. Each boat comes with many standard features including double coated heavy duty fabric, double-bonded airtight seams, carrying bag and repair kit.